The trend of home concealment furniture has picked up speed recently, especially with crime being on the increase. Multitudes of firearms-related conventions, trade shows and expos across the country are featuring these products. It’s an interesting concept – hiding firearms in plain sight where no one would bat an eye at it being anything other than furniture to complement your existing home décor. 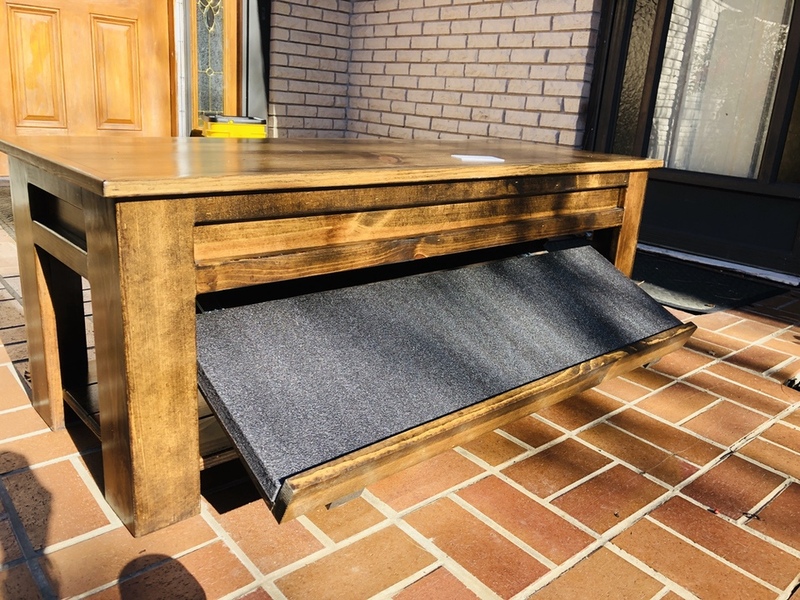 Here’s my review of a hall bench that will conceal a firearm, from Liberty Home Concealment. My husband and I recently purchased a new home. One of the exciting aspects of moving into a different house is making it uniquely ours. We started by stripping off the old wallpaper and painting most of the walls in the house. Next, we tore out the old turquoise carpet that had probably been in the house since it was built, and replaced it with vinyl flooring. New windows were installed throughout the house, a few light fixtures replaced and a couple other small projects completed. While all those completed projects make the house feel cozy, there stood an empty spot just inside my front door that screamed for attention. My vision? To have a bench where family members or guests could stop, just inside the entryway and sit to remove their shoes. We live in the country, where dirt is plentiful and likes to make its way into the house via footwear. 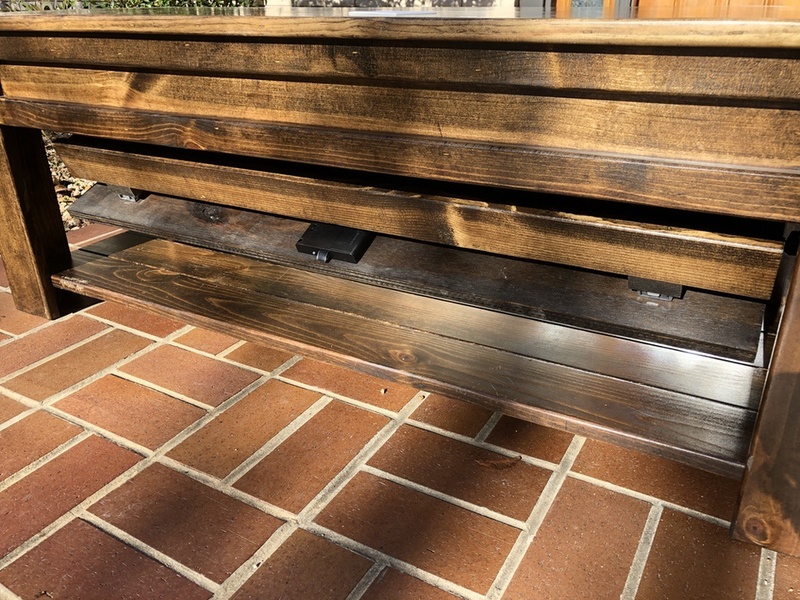 While a plain bench would serve that purpose, I also desired a way to have a firearm close to the front door for quick access in the event I didn’t have my personal protection gun nearby. A safety plan is important to me, so why not incorporate a way to store a firearm inside the bench to allow it to be multi-functional? Not far from me, in Norwood, Missouri, is a company that makes custom concealment furniture, Liberty Home Concealment. This is the same company that made the beautiful Patriot Wall Mantle that I reviewed here. Knowing how amazing their products were, I contacted them about my idea. 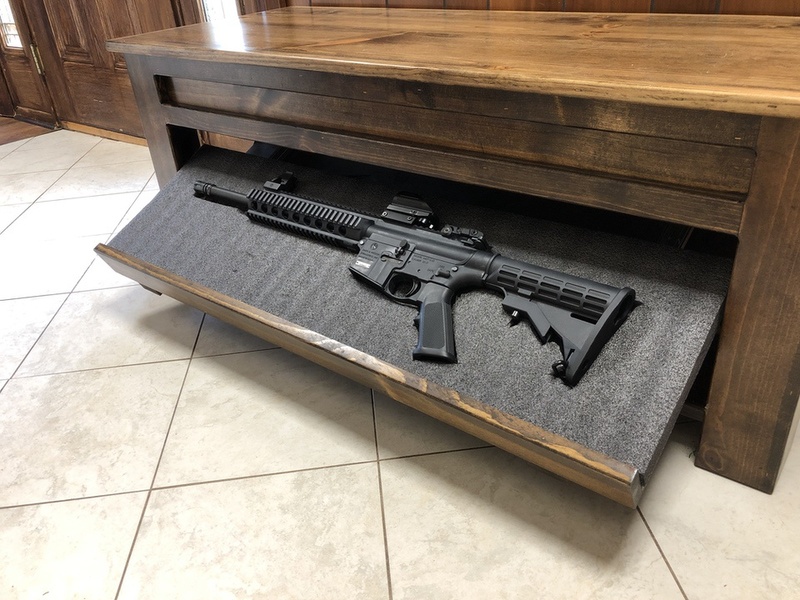 I spoke to Curtis Smith, the owner, explaining that I was wanting a hall bench that would have a drop-down concealment compartment. I gave him a general overview of what I envisioned the finished product would look like and chose the Dark Walnut stain, but left the rest up to him to work his magic. 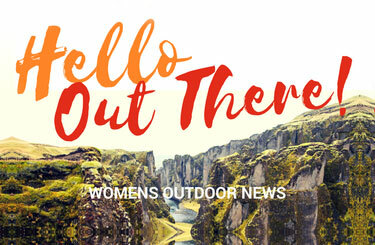 When the bench was completed, Barbara Baird, Women’s Outdoor News publisher, offered to personally deliver it to me, since she’d be coming to town. We met for lunch and later, made the hand-off in the Chick-fil-A parking lot in Springfield. This bench is beautiful! The dark walnut color suits my style and fits with the somewhat rustic look I had envisioned. The bench came assembled, and as I mentioned in my review of the wall mantle, that’s a big bonus! Furniture assembly should be outlawed! 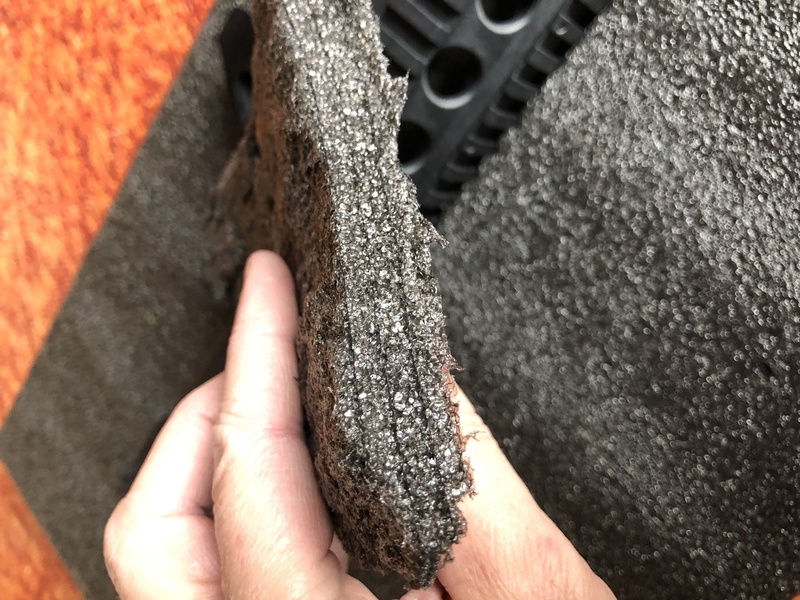 A standard Kaizen foam pad comes fitted to each specific product. My only job was to trace the outline of my desired gun(s) that I planned to conceal inside. With a fine-tip pen or Sharpie, it’s easy to do. Afterwards, I carefully cut out the shapes with an Exacto knife. It’s important to note that the foam has peel-away layers to easily achieve the desired depth. The foam holds the contents in place, while protecting them from rolling around inside or getting scratched. My bench came with an RFID card to unlock the concealed compartment. By placing the card in the designated spot, the internal locking mechanism disengages. By pressing up on the compartment below the bench seat and releasing it, it’s able to drop down, revealing the hidden firearms. When opened, the compartment not only drops down, but the hidden tray slides outward for easy access. Some of the most frequently asked questions of this company are listed below. How many different finishes does Liberty Concealment offer? There are 20 stain colors available, plus black or white distressed. If there’s a color or stain that’s not listed on their website, please contact customer service for additional options. What are the locking options? Standard magnetic locks are the base add-on option, however keyed and RFID locking mechanisms can be utilized in any of their products. How many options of furniture pieces? Liberty offers products that include picture frames, table top lamps, mantle clocks, wall art and concealment flags, end tables and coffee tables and more! What is the price of concealment furniture? Because of the many options available, prices vary. Take a look at the website for all product/price options. Anyone who purchases one of Liberty Concealment’s products will quickly see that they’ve put a lot of care and craftsmanship into each piece. Whether you’re wanting to conceal firearms or other household valuables, you’re sure to find the perfect item to fit your décor. 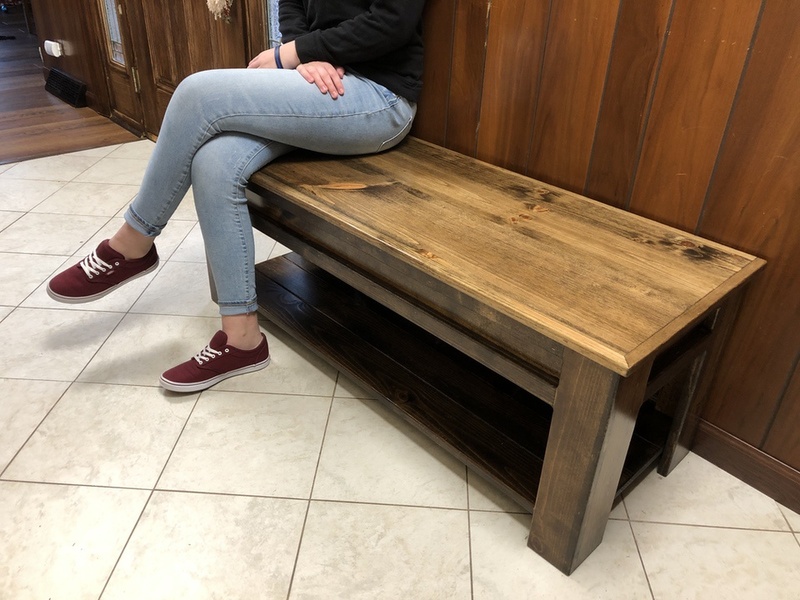 My specific bench was customized to my specifications, and I’m extremely thrilled to show off such a beautiful work of art to my friends and family, without advertising that there’s more to it than meets the eye! Although the deadline for Christmas deliveries is passed, you may still order a gift certificate, or place an order. After the holidays, orders typically will take 10 to 14 days, plus UPS shipping time. Visit Liberty Home Concealment here. Read Michelle Cerino’s review of the Liberty Home Concealment shelf here. This product was provided to our reviewer and she received it for her honest opinion of the item.